David Michal Brown was born February 25, 1970 in Westfield. Tall and athletic, he excelled in a number of sports as a boy, including basketball and lacrosse. His strong arm and leadership skill made him a natural at quarterback, and he became the star of the Westfield High Blue Devils. He was All-State in football, basketball and lacrosse. Among the schools that recruited Dave were the Duke Blue Devils. He accepted a scholarship from Duke, anxious to play for former NFL quarterback Steve Spurrier. Dave began his Duke career in 1989 as the backup to quarterback Billy Ray. He got his first against Wake Forest midway through freshman year. He torched the Demon Deacons for 444 yards in a 52–35 win, including a 97-yard TD pass that set a school record for the longest play from scrimmage. Two weeks later, Dave set another school mark when he threw for 479 yards in a 41–0 blowout of UNC. The Blue Devils finished 8–3 with a share of the ACC title, and earned a spot in the All-American Bowl. Dave had 268 yards and three touchdowns, but the defense could not control Texas Tech and Duke lost 49–21. He finished the year with 1,479 passing yards with 14 touchdowns in 8 games. Dave started for Duke in 1990 and 1991, but in both years the Blue Devils were a sub-.500 team. He threw for 1,444 yards as a sophomore and 2,794 yards and 20 TDs as a junior. Dave thought about entering the 1992 NFL Draft at the end of his junior year, but decided not to. He changed his mind after the draft and made himself available in the supplemental draft, and was taken by the New York Giants. 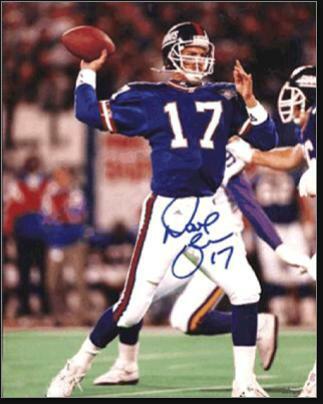 Dave’s rookie year was spent as a backup to Phil Simms and Jeff Hostetler. He saw action in two games. He got into one game in 1993. Finally, in 1994, Dave got a shot at the starting job after Simms retired. He beat out Kent Graham and led the Giants through a Jekyll and Hyde season. Big Blue won its first three games, then dropped seven in a row, and then won the final six games to finish 9–7, just missing a Wild Card berth. Dave passed for 2,536 yards, with 12 touchdowns and 16 interceptions. The final six wins were all close games—none was decided by more than a touchdown. Dave held the starting job for two more seasons, but the promise of 1994 faded as the Giants won just 11 of 32 games. Dave threw for over 5,000 yards. In 1997, Dave was injured midway through the season and lost his job to Danny Kannell. The Giants finished with 10 wins and nearly beat the Vikings in the Wild Card playoff game. That summer, the Giants traded Dave to the Arizona Cardinals. He played four more years as a backup to Jake Plummer. After football, Dave got into the investment business, working for New York Life, Lehman Brothers and Greenhill & Company.